GoPro have announced the latest versions of their 4K action cameras - the GoPro Hero7 Black, Silver and White. Loved by adventurers and action fans all over the world, the name is synonymous with the small camera that can be used by anyone - from cyclists to surfboarders, and the rest! We took the higher-spec GoPro Hero 7 Black out and about to see how it would handle, from being strapped to our chest while playing football to being dunked underwater to catch some footage of fish. The GoPro Hero 7 (Black) used with a chest-harness during a game of football. Let’s start with the main feature that really blew us away when using the Hero 7 Black – the HyperSmooth Video Stabilisation. GoPro say that this feature not only corrects shake as it happens but also works using an algorithm that actually predicts (and counters) your movements. You can see in the video the difference that this makes when it is switched on / off – the direct comparison when Gareth (our video-man) is running with it shows significantly smoother footage. Focus on the building in the background in the harbour scene, and you can see a noticeable difference in terms of how level it stays with the horizon when it is switched on. 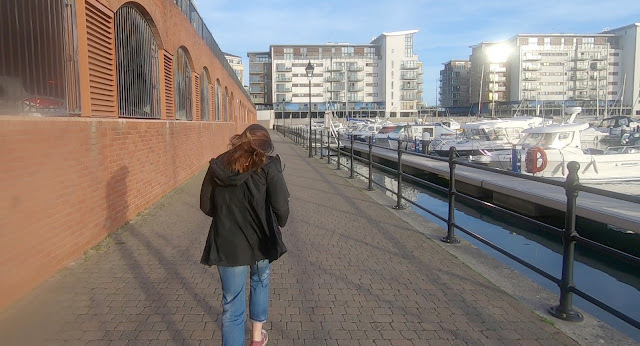 A still from the video below - when watching the video, focus on the building on the centre of the horizon to get an understanding of how effective the HyperSmooth Video Stabilisation is. GoPro’s are known for their portability, and since their launch have been loved by those with a taste for adventure. The good news is that on the outside, not much has changed – including the shape and dimensions. This is good news for anyone with a Hero 5 or 6, as it means that most of the accessories are fully compatible. There is no shortage of ways that you can think to mount this camera – from dog harnesses, surfboard mounts through to underwater housing (60m), the accessory range really helps you get the most out of your GoPro – the only limit is your imagination. 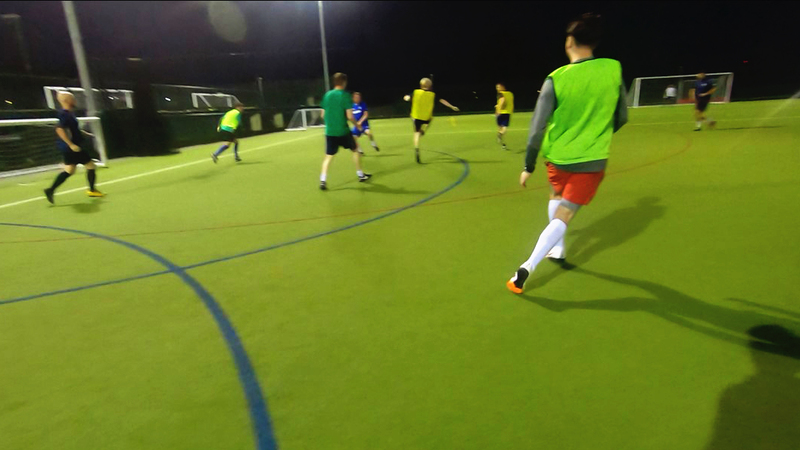 Gareth used an accessory stick for his vlog style introduction to the video, while I used the chest-mount harness for filming while playing football. The Hero 7 felt as solid as ever – casing helps protect it from knocks, while it is waterproof up to 10m. It will admittedly face more severe challenges, but we had no concerns when testing it, from dunking it underwater, mounting it on a car, or even surviving the hustle and bustle of being strapped to my chest during a game of football. Note - The different colours have different specifications on them, with White the most basic spec, through to the black, which has all of the bells and whistles. The menu is accessed via touchscreen, which is nice and responsive, and also easy to use considering its small size. The layout is nice and simple, and navigating between the modes can simply be done by swiping across the screen. There are three main modes – photo (including 12MP RAW), video and timelapse, all of which are instinctive to find and use in the menu. While the whole premise of the GoPro is really ‘set-up and go’ (after all, who wants to be fiddling about when the camera is mounted to record action video? ), but there are nice touches that make it user-friendly – such as clearly displaying which stabilisation modes are available when selecting your video resolution. Timelapses and 'time-warp' (Hyperlapse) are also simple to set-up, taking away any complexity of creating in post-production. Considering how small the actual camera is (it fits in the palm of your hand), we were amazed at the quality it produced, even in challenging lighting conditions. We’ve already mentioned smooth, stabilised footage that could normally only be achieved with a hefty gimbal, but there are other features that make the GoPro Hero 7 great. You can capture fantastic 8x slow-motion footage (Full HD/1080 at an incredible 240 FPS) to capture those moments that may otherwise be missed. Perfect for adventure and sports footage, and anyone with a creative eye for video. 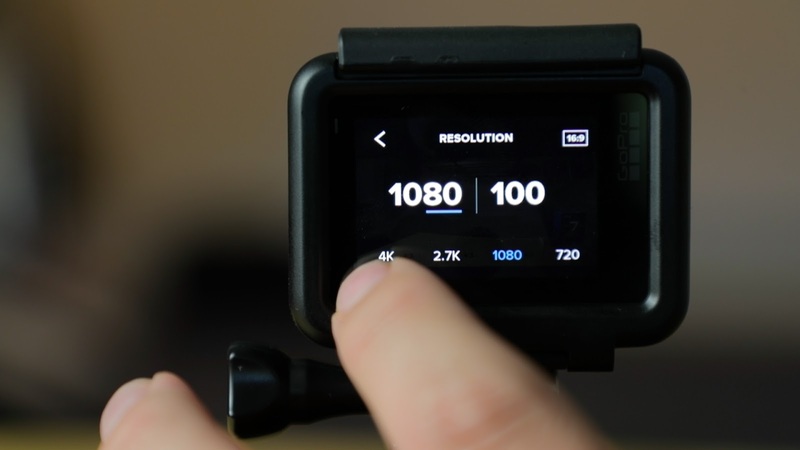 There is also a choice of colour profiles available – GoPro’s colour option, which is nice and saturated, or a flat profile. The flat profile is handy for when you are compiling footage shot at different times, allowing you to apply a consistent colour profile to all of your footage in post-production - giving your final video has a consistent look. So it was telling that Gareth introduced the video without a lapel microphone (mic) – this was because he was not only impressed with the clarity of the 7’s in-built mic, but also the manner in which background noise is cut out. When playing back the football footage the sound quality was truly remarkable – picking up conversations over conditions (wind, movement & distance) that we were not expecting. The GoPro Hero 7 comes with all the connectivity mod-cons that you would expect in 2018, and when combined with the GoPro App on your phone, it truly is versatile. In-camera features such as Face, Smile and Scene Detection allows the app to compile video highlights for you. Using the App you can also auto-transfer files to your phone, and share directly from the GoPro App to your Instagram story. If your phone has GPS enabled, then you can also record and display labels on your footage showing features such as location, speed and altitude. So now you can really wow (or bore!) your friends with ALL the details from the last time you went skiing! If you have any questions about the GoPro Hero 7, add a comment below and we'll get back to you! How does the GoPro Hero 6 compare to the Hero 5?